Deciding what to see and do in London can be challenging as the list is virtually endless. Here are some tour options to inspire you. With so many amazing sights and places to visit in and around London, where do you start? Here is a list of all the available tours and add-ons with Transat Holidays which are bookable before you depart home. It is a great way to plan your vacation and secure your spot on a tour. Any a question? Give us a call, we are happy to help. A great afternoon tour of London! Start off with a guided tour of St. Paul' Cathedral and, if you wish, climb the 259 steps up the dome where you will find The Whispering Gallery, which runs around the interior of it. Next, is a guided tour of the Tower of London where you will see the magnificent Crown Jewels, Queen Elizabeth II's solid-gold crown, the enormous Cullinan diamonds and the extraordinary Koh-I-Noor. End your day with cruise on the Thames (one-way from Tower Pier to Westminster Pier, or vice versa if you choose to do the cruise on another day). 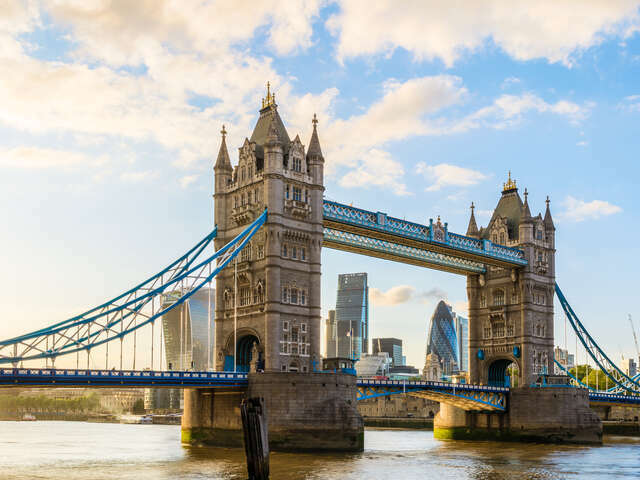 Enjoy an afternoon tour of London that includes a guided tour of St. Paul's Cathedral and its magnificent dome, a guided tour of the Tower of London to see the stunning Crown Jewels, and a cruise along the River Thames. The evening brings you to the darker side of London - where the city's darkest secrets will be revealed by your knowledgeable guide. See the Theatre Drury Lane, the Old Bailey, the home of Sweeny Todd and walk the trail of Jack the Ripper to inspect the sites, decipher evidence and discuss the suspects - to this day the case remains unsolved! Calling all shoppers! Hop aboard for express service from London to Bicester Village by luxury motor coach and shop to your heart's content! Home to over 130 designer outlet boutiques and offering up to 60% off previous seasons'; collections, this delightful pedestrian area is located in Oxfordshire, close to the Cotswolds, approximately one hour from London. Enjoy even more savings thanks to your VIP card that will give you an additional 10% savings at certain boutiques. A full-day tour to explore the magnificent State Rooms and walk through the stunning gardens of Blenheim Palace - birthplace of Sir Winston Churchill - followed by visits to the enchanting, thatched-roof villages of the Cotswolds, including the village of Bampton, where many scenes from Downton Abbey were filmed. Tour the sites that made the 'Sixties Swinging'. Explore historic London neighbourhoods, pubs, clubs and boutiques that inspired so many well-known lyrics. See the famous Abbey Road recording studio and walk across that iconic crossing! Pass by the homes of David Bowie, Jimmy Page and Van Morrison and hear many of their legendary rock tales. With the fast track ticket, you skip the line-up! Check in 15 minutes before your "flight" and get a bird's eye view of London on the world';s highest observation tower. The Eye takes you 135 m above the River Thames in a high-tech capsule where you will have the most amazing panoramic view of London. Accompanied by a professional tour guide, discover the sinister and ghostly side of London on this evening tour and enter the world of Britain's first serial killer, Jack the Ripper. Visit the sites where he hunted and viciously murdered five prostitutes in 1888. This is a combination coach/walking tour and will finish at a traditional London Pub near Trafalgar Square (drinks not included). See the fairytale of Leeds Castle, famous for its collection of medieval furnishings, tapestries and impressionist art, before moving on to the town of Canterbury and its Cathedral. Continue your tour through picturesque Kent, before arriving at the magnificent White Cliffs of Dover. Discover the all new, bigger and bolder London Dungeon! Travel back to the darkest moments in the capital's history to the deep depths of the London dungeon. Everything you see is based on real historical events like Jack the Ripper, the Great Fire of London, ancient tortures and the plague. With two state-of-the-art thrilling rides, the London Dungeon provides an exciting and fun experience that will leave your family screaming for more! The ultimate starter tour for those looking for the full London experience! See the Changing of the Guard, Westminster Abbey and Buckingham Palace before a guided tour of two of London's must-see icons - St. Paul's Cathedral and the Tower of London. Save time and money with London's sightseeing pass as it gives you free access to more than 60 London attractions and quick access to many popular sites. But there's more... Pay no commission when you exchange money, enjoy free admission to certain exhibitions, and receive discounts and special offers at some restaurants and theatres! The full-day tour begins with a panoramic drive around Parliament Square to see Westminster Abbey, St. Paul's Cathedral, the London Eye, Big Ben, The Shard, Tower of London and much more. At Windsor Castle, explore the Royal residence, then travel to the stunning Hampton Court and Gardens, the former home of Henri VIII. Filled with 14 exciting, interactive zones and the new Marvel Super Heroes 4D movie experience, Madame Tussauds London combines glitz, glamour and incredible history with over 300 wax figures. This ticket also gives you access to the Star WarsTM immersive experience starring life-like wax figures of the iconic heroes and villains of Star WarsTM Episodes I-VI. Filled with 14 exciting, interactive zones and the new Marvel Super Heroes 4D movie experience, Madame Tussauds London combines glitz, glamour and incredible history with over 300 wax figures, including Lady Gaga, the Beckhams, the Queen and many, many more. So, who do you want to meet? True fans of rock will not want to miss out on this full-day tour that combines the Rock n' Roll morning tour and the Classic Rock Legends afternoon tour.Tour the sites that made the 'Swinging Sixties'. Explore historic London neighbourhoods discovering the roots of rock, then hit the pubs, clubs and boutiques that inspired so many well-known lyrics, including the legendary Abbey Road recording studio! This morning tour is the perfect introduction to London as you explore the city with professional guide. See Big Ben and the Houses of Parliament, Westminster Abbey, Trafalgar Square and the Changing of the Guard at Buckingham Palace (should there be no Changing of the Guard, the tour will include a visit to the Horse Guards Parade). This morning tour is the perfect introduction to London as you explore the city with professional guide. See Big Ben and the Houses of Parliament, Westminster Abbey, Trafalgar Square and the Changing of the Guard at Buckingham Palace (should there be no Changing of the Guard, the tour will include a visit to the Horse Guards Parade). End your day with cruise on the Thames. This morning tour is the perfect introduction to London as you explore the city with professional guide. See Big Ben and the Houses of Parliament, Westminster Abbey, Trafalgar Square and the Changing of the Guard at Buckingham Palace (should there be no Changing of the Guard, the tour will include a visit to the Horse Guards Parade). Then in the afternoon, hop on the Express Coach Service from London to Stonehenge to explore this mystical site (entrance fee included). Tour the sites that made the 'Swinging Sixties'. Explore historic London neighbourhoods discovering the roots of rock, including sites connected to the Beatles, U2, Clash, Queen, Who, Pink Floyd, Elton John, the Rolling Stones and more! Begin your tour with a visit of Salisbury&#39;s cathedral, the inspiration behind Ken Follett&#39;s best-seller <em>&quot;The Pillars of the Earth&quot;</em>. Next is mysterious Stonehenge - the true meaning of this ancient, awe-inspiring creation has been lost in the mists of time. Was Stonehenge a temple for sun worship, a healing centre, a burial site or perhaps a huge calendar? Finish your tour with a visit to the ancient Roman city of Bath, renowned for its wonderfully preserved Roman baths. A spectacular live guided open top tour of some of the very best sights of London by night! This tour has been especially designed to show you the very best of London's famous landmarks, all beautifully lit up in the night sky. Tours are fully guided and you'll get to see: Big Ben, the Houses of Parliament, Westminster Abbey, the London Eye, St. Paul&#39;s Cathedral, the Tower of London, Trafalgar Square, Piccadilly Circus, Harrods, the Natural History Museum, Royal Albert Hall, Wellington Arch, Fleet Street, St. James' Palace and Marble Arch. Step into and star in your very own hilarious adventure to the kingdom of Far Far Away - surrounded by Shrek, Princess Fiona, Puss in Boots, 'Gingy' the Gingerbread man, Pinocchio and the Three Little Pigs. Enjoy 10 fairy-tale themed shows with a good dose of Donkey's cheekiness, amazing animation and captivating storytelling from Dreamworks, the producers of Shrek. The iconic dome in London's skyline is of St. Paul's Cathedral, and there's more to it than that! Experience St. Paul&#39;s Cathedral in its entirety, from the Crypt through the Cathedral itself and up to see the Whispering Gallery, Stone Gallery and Golden Gallery. The interior of the soaring dome, the glittering mosaics, the intricate stone carving and the breathtaking view down the nave towards the quire are just a few of the reasons why a visit to St Paul's is a must! A full day, leisurely paced tour to Stonehenge and the Georgian city of Bath, with plenty of time to explore. The first stop is mysterious Stonehenge - surrounded by mystery, Stonehenge never fails to impress.Then enjoy a whole afternoon to discover Bath's major sights; go on walking tour then enjoy time at leisure to discover the Jane Austen Visitors Centre, Bath Abbey or the Roman Baths. There is so much to see in this beautiful city! Discover London aboard a double-decker bus with a hop-on hop-off pass, valid for a full day that lets you get on and off the bus over a 24-hour period. With 3 sightseeing bus tour routes (over 90 different stops), frequent service (every 15-20 minutes) and a free hop-on hop-off Thames River Cruise pass, you'll have total flexibility to explore London at your own pace! The Shard is an iconic, landmark building on the London skyline, designed by Master Architect Renzo Piano. At a height of 1,013ft (310m), the tallest building in Western Europe, the Shard redefines London&#39;s skyline and will be a dynamic symbol of London, recognizable throughout the world. The View is situated at the top of The Shard, on floors 68, 69 and 72, and almost twice the height of any other viewing platform in London! Immerse yourself in the world of Harry Potter with a behind-the-scenes tour of the Warner Brothers Studio in London. This unique walking tour showcases a huge array of the beautiful sets, costumes and props used in the movies. It also reveals some closely guarded secrets, including facts about the special effects that made these films so hugely popular all over the world! Tour the enchanting Cotswolds, a blend of charming villages with thatched cottages, tea shops and ancient inns. Then visit medieval Warwick Castle and travel back in time as you learn about the castle's 1000-year history - to a time of bloody battles, extravagant banquets and royal ceremonies. Next, you&'ll see the birthplace of world famous playwright William Shakespeare in Stratford-upon-Avon and end your day exploring the cobbled streets of Oxford, with its famous University colleges. One of the world's greatest churches, with a history stretching back over a thousand years, Westminster Abbey is a must for any trip to London. An architectural masterpiece of the 13th to 16th centuries, Westminster Abbey has been the traditional coronation site for English monarchs since 1066 and for numerous other royal occasions - including sixteen royal weddings! Begin your tour with a visit of Windsor Castle, home of the Royal Family for 900 years. Then travel through the rolling green Wiltshire landscape to see Stonehenge near Salisbury Plains. Finish your tour with a visit to the ancient Roman city of Bath, renowned for its wonderfully preserved Roman baths. Begin your tour with a visit of Windsor Castle, home of the Royal Family for 900 years. Then travel through the rolling green Wiltshire landscape to the ancient stone circle of Stonehenge, a mystifying UNESCO World Heritage Site. Finish your day with a walking tour of Oxford, the City of Dreaming Spires, that is home to the world's most famous university.